The trainings can be attended as a package or separately. Each participant receives a certificate for an individual training, as well as for the cumulative innovative management skills training package. For your readiness to take an action and choose the complete certified management training package, we will provide savings of 10%. For the attendance of 3+ persons from the same company, we are pleased to offer you an additional savings of 10%. 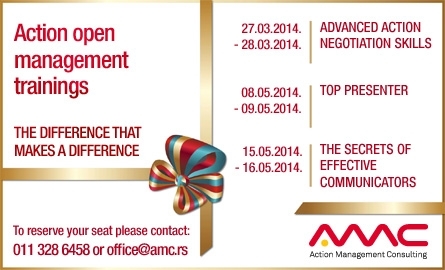 For additional information and reservation, please contact us: +381 11 328 6458 or office@amc.rs. Great atmosphere, excellent selection of participants. Friendly environment, exchange of experience and a wonderful way to learn something new. The trainer takes you from one level to another seamlessly, easy, while you are aware at every moment that you make progress. Do not miss this experience. I recommend this training to everyone that finds themselves in situations they think they cannot overcome. It only takes a small effort in different direction (leaving the comfort zone) to turn things around. My choice for training is always according to the energy of the person / trainer, and that is Goca Berger. Maybe a little bit smaller groups would be more effective model for my personal progress during the training, but I completely fulfilled my expectations! This training is mandatory. It is for all emancipated business people today, both for employers and for service providers. This training will significantly upgrade (improve) your position in negotiations. I’ve reached very useful information and self-knowledge. I am sure that all what I have heard, seen, felt and experienced will be very useful to me, in my business and private life. Gordana Berger is a woman whose example I follow in every aspect of my life. Talks with her give me strength, and her advices make my fate in myself stronger. This is how I felt as well when I was attending this training. An impressive record of resources which are at our disposal and how the majority of solutions we already own if we manage to strengthen the will and determine the discipline that brings us forward.